Janis Lyn Joplin was considered the premier female blues vocalist of the Sixties; her raw, powerful and uninhibited singing style, combined with her turbulent and emotional lifestyle, made her one of the biggest female stars in her lifetime. She died of a drug overdose in 1970 at the age of 27 after releasing only four albums. 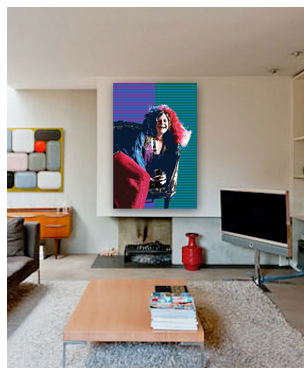 Metal print of Janis Joplin shown in family setting. Mercedes Benz, the final song she recorded. 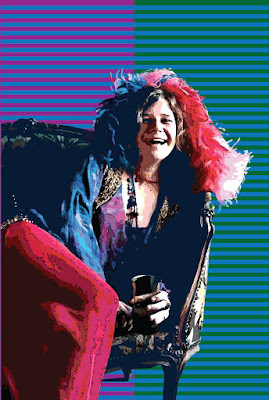 Audiences and critics both referred to her stage presence as electric and Rolling Stone ranked Joplin number 46 on its list of the 100 Greatest Artists of All Time in 2004 and number 28 on its 2008 list of 100 Greatest Singers of All Time. She was inducted into the Rock and Roll Hall of Fame in 1995. Joplin remains one of the top-selling musicians in the United States, with Recording Industry Association of America certifications of 15.5 million albums sold in the USA.